For discussion, can we list 5 coaches in that category? Personally I would be ok if Clemson hired any of these guys away from their current jobs to come in and run the program. Weird that 370 people read the post and only one even had any suggestions. All the time we hear, we need to get a established, successful coach, yet nobody seems to have any ideas who that could be. By the way, not trying to rail on Brownell. I'm hoping we win the NIT, and let the rest take care of itself. If you showed Steve Alford the money he would come here. He was a candidate here when he was at Missouri a State before we hired OP. Also, Shaka Smart, and others. If Thad Matta is healthy he would be one. Shaka is less successful at a better supported program in a weaker conference. Brad is doing more with less. Alford not only could not win at UCLA, but also could not coach defense and would lose a locker room 5-10 games into the season. Matta is a fantastic coach but I bet would demand Assistant resources that Clemson will not provide. In 1980 when Coach K was hired Duke had some history in the NCAA tournament back in the 60s but they were not a blueblood as we now consider them. Duke hired Coach K, who at the time had been a head coach at Army for 5 years with one NIT appearance. The rest is history. if BB were let go, and Texas were to let Shaka go... he would be a fantastic hire for Clemson. Fantastic. Nothing is guaranteed, obviously. But you are talking about a guy who will IMMEDIATELY improve recruiting and our brand. He will bring an exciting style, and put people in the seats. It didn't go how many thought it would at Texas... but he won at VCU. A risk? Sure. One worth taking? IMO, it's a no-brainer. If we had an opening and he was on the market, he would be an excellent hire for Clemson basketball. I’d take Smart in a heartbeat for all the reasons you stated. Winning at VCU us a LOT easier. It is a basketball/tennis first school. VCU is larger than Clemson without a football program, in a very BB friendly town. There is a reason they sell out each game, even the meh opponents. Shaka could/would like be bottom of the table in the ACC. Why? Because I have a great comparison. Jeff Capel. - The coach responsible for VCU's modern basketball success. He then went to Oklahoma and is now at Pittsburgh. What happened? Could not win in the B12, now a bottom dweller in the ACC. You want ANOTHER example: Anthony Grant. Kept VCU rolling after Capel, went to Bama, lost, and is now at Dayton I think. So tell me how Shaka, who is not winning at Texas in a weakening B12 can come into a very strong ACC team and start winning. Keep in mind that Shaka never finished 1st in his conference during the season. Relied more on runs in the Tournament that during the CAA years were held in Richmond. Shaka's performance has declined at Texas. Havoc is now easily defeated and the game has moved on... if he can't win at Texas, he has no hope at Clemson. guys that didn't pan out, there are examples of guys that did. To say he won't win here is asinine. He may or may not. I would get your point if Shaka was taking over a program that had went to 3 straight NCAAT's, like BB did. He took over a program at Texas that had been to something like 15 NCAATs in 16 years (or something). He would be taking over a program here that has NOWHERE TO GO BUT UP. If he didn't work out, fine. But he would absolutely be a shot of adrenaline in the program, and if he didn't progress, it would be the same as what we've seen over the past 9 years. By the way- Capel went to 2 NCAAT's in 5 years at OU, with a run to the elite 8. They missed postseason 2 years in a row, and OU fired him. That's the difference in OU and Clemson. 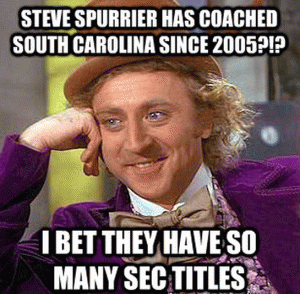 So explain to me why Shaka who took over a program that went to the NCAA tourney 16 of the last 17 years and has now run it into the meh-ville could win at Clemson... a program that has less NCAA appearances in its total span. VCU went dancing 3 our of the 6 year before Shaka and finished 1st in conference play all three years. I don't want "more attendance" I want 9+ wins in conference. Tell me how Shaka can do that. I see a 41% conference winning record at Texas with only one elite program in competition. We are not at the "nowhere but up" are you joking? We are literally in our best SUSTAINED run in program history. I don't want optimism that they *could* do better. We are not 0-18 in conference play, we are at that cusp and are competitive in league play. If Shaka doesn't work out then we are looking at finding a coach that can rebuild. Few can do it. Go ask Wake about that. Actually, the guys that don't pan out appear to be 15:1 for every guy that works. It all comes down to what you value. What is it that equates success in college basketball? Is it beating the lower half of the conference? Is it 9 conference wins? Is it "being in the conversation" every year for the NCAAT? Or... is it postseason (NCAAT) berths? If it's just a winning %, with nothing to show for it, then we are right where we need to be. That's exactly what BB has. He has a winning % that is higher than historically at Clemson... but he has ZERO to show for it. He has less to show for it than Barnes and OP, and could be argued Ellis. It just comes down to what you value. If he wins enough for you, fine. We have seen Clemson be an NCAAT team year in and out under both Barnes and OP. I don't want to hear "different time" crap. We were in the mix every year. It can be done. It has been 9 years, with 2 NCAAT berths, and we are essentially starting over again next year. Zero to show for it? Show me OP's sweet 16 run. Show me anyone's graduation rate. Show me Ellis with a clean program and a winning record. Ellis only finished above .500 twice. Exactly, Brad has a higher winning % historically and arguably our 3rd/4th best season ever. OP and Barnes did not sustain any runs. OP stumbled over un-recruited NBA talent and Barnes had modest NBA talent pre-mid major days. What has Brad shown: Highest ACC winning %, playing a harder OOC schedule, sweet sixteen, and did it cleanly with high Grad rate. If you are going to make a change then I want a great plan/choice, not a risk. If anything, Brad's mid-table runs are going to make us a better program if we don't get impatient and unrealistic about results/investment. Post Brad, a successful potential coach will look at us as a stable program in a good league vs Shyatt basement dweller with unrealistic expectations. Guess what. It is college sports. You start over every year. Programs take decades to build (a moment to collapse). He know the program real well to and OP was a disciple of his. He might hire OP to come as an assistant and help. He is an East Coast guy rather than South West it West Coast guy. It was a bad fit at Texas.